I can’t believe that I’ve let 2 months go by without blogging. The truth is that we’ve been very busy and I haven’t been doing much photography, which (oddly enough) is often what inspires me to write. Jim spent considerable time volunteering, along with a couple of other retirees, to build an addition on the Children’s Center here in town. I’ve been doing a little volunteering here and there, knitting, and working on the boat. There’s a lot going on around town through the winter and early spring, and it keeps our calendars full and our days happy. Life remains good here in Petersburg harbor… Now that we’re getting more settled here, we realized that it was time for eye checkups and new glasses. An island community with 2500 people can’t offer all the medical services that people need, but our medical center has a Visiting Doctor’s office with a packed schedule of various specialists who come to town. We heard an announcement on the community radio station that one of the optometrists was coming, so we made appointments. The Visiting Doctor’s office has all the necessary eye exam equipment, as well as a variety of other bulky or fragile devices needed by the various specialists. The optometrist brought a nice variety of glasses to choose from, and we got our new ones in the mail about 2 weeks later. 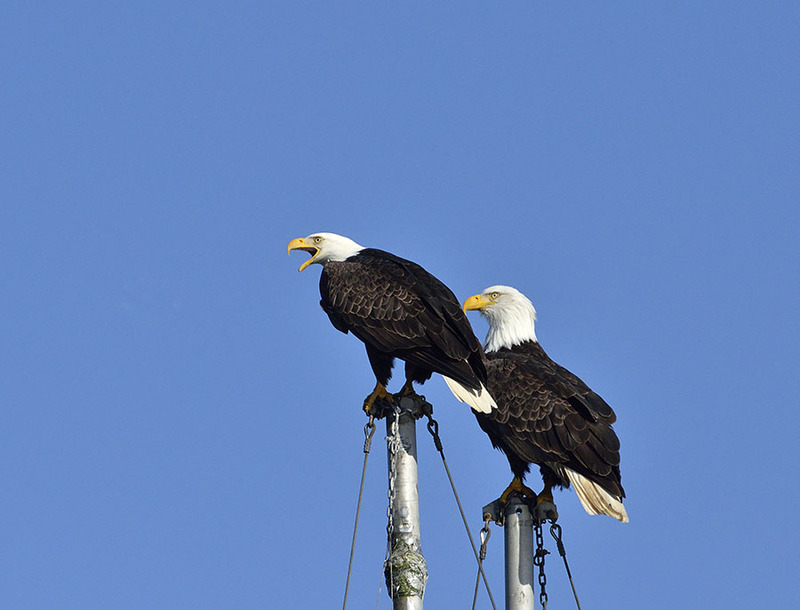 We don’t have eagle vision, but it’s much better with our new specs! For the past couple of months we’ve been gaining 5 minutes of daylight every day, going from a short 6 hours 42 minutes at the Winter Solstice in late December to 14 hours 46 minutes today, culminating in about 18 hours of daylight at the Summer Solstice in June. A 5 minute daily gain makes it hard to judge what time it is by the position of the sun – figuring out when it’s time to start fixing dinner requires looking at a clock. We ended up having a mild winter, so the spring bird migration seemed to be a little early. 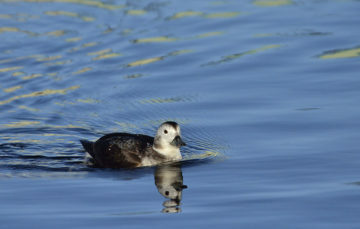 All winter we enjoyed the flocks of long-tailed ducks (sometimes called oldsquaw), with their funny calls and shy nature. As is often the case with birds, the females aren’t particularly pretty, but the males have the distinctive long tail, and beautiful white feathers on their backs. 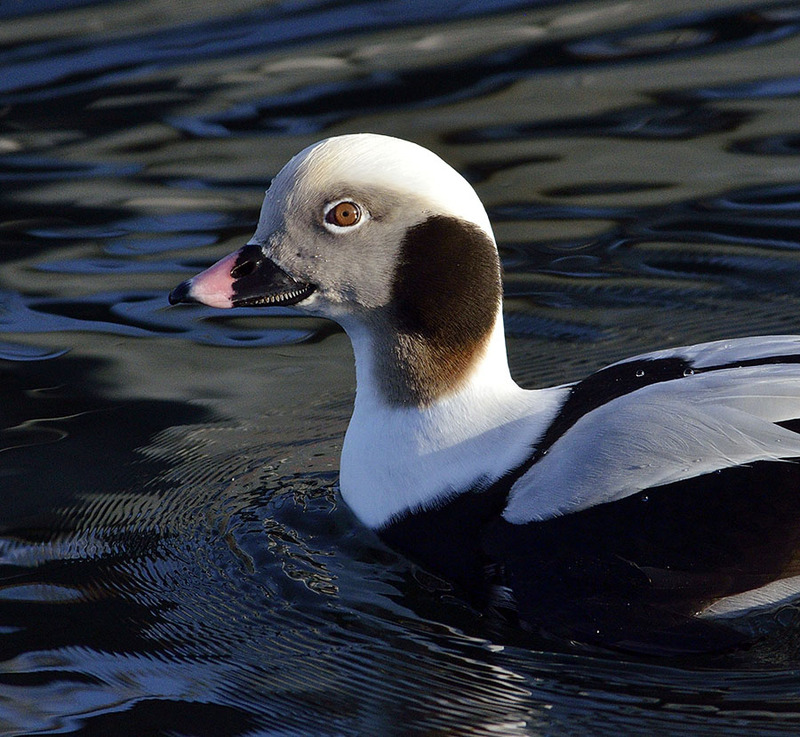 In our part of the harbor the long-tailed ducks, scoters, mergansers and loons are most common. 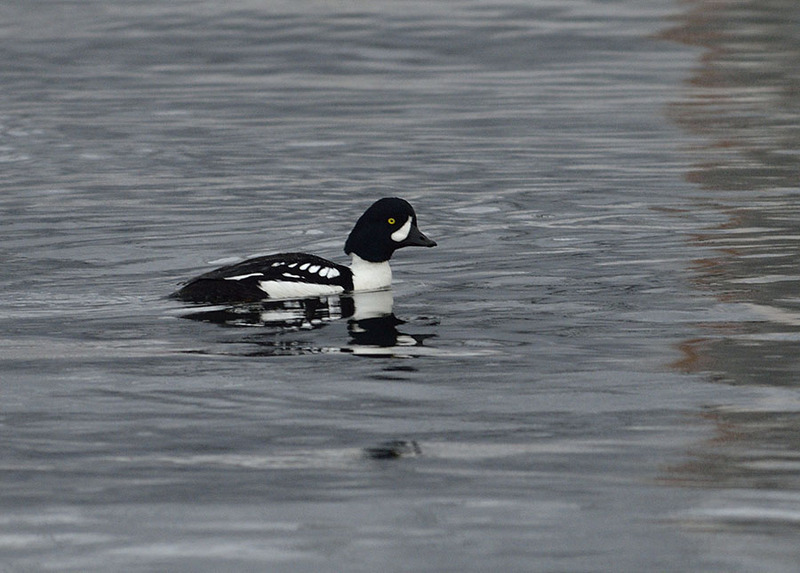 In the South Harbor they don’t often see the long-tailed, but they have lots of Barrow’s goldeneyes. I really need to spend more time stalking birds on the other docks. 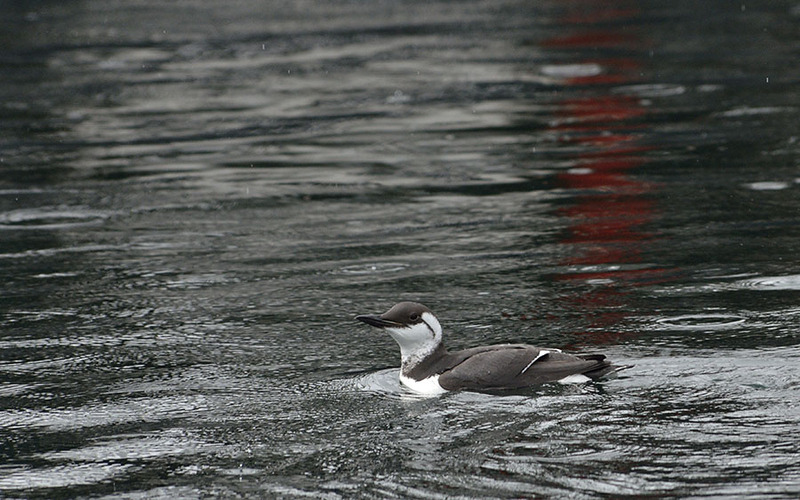 Other late winter visitors included black guillemots, which move farther north for the summer; we typically see the pigeon guillemots here in southeast Alaska in summer. 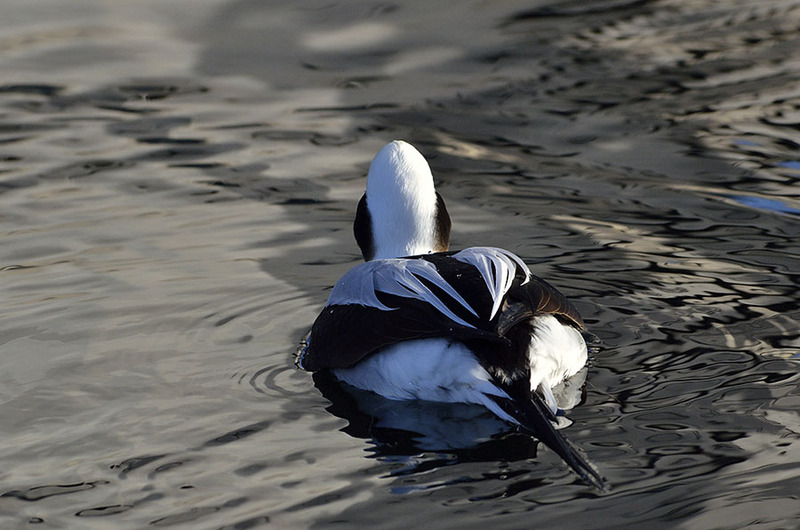 We also saw a lot of thick-bulled murres, though all these visiting ducks and the trumpeter swans are now gone for the season. The seasons seem to transition rather abruptly here. 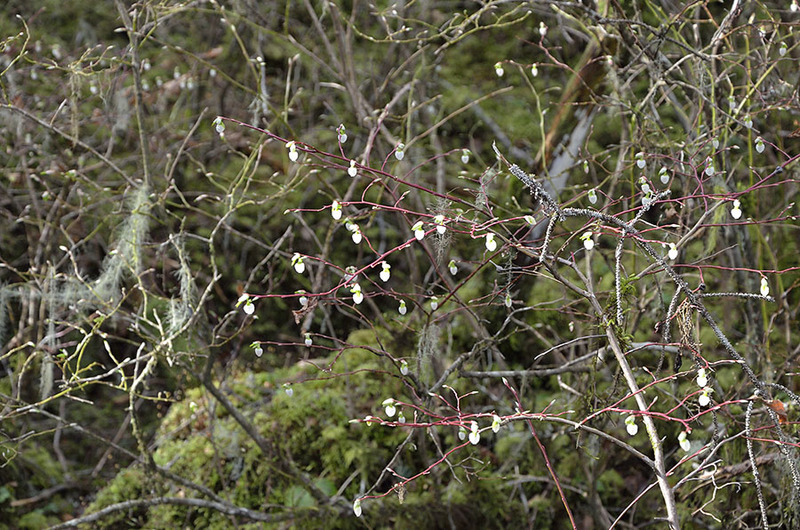 We were hiking in the woods a month ago and noticed the berry bushes starting to bloom and the skunk cabbage popping up. The temperature is in the 50s during the day now, and when the sun shines it’s nice and warm. Daffodils are up, and tulips are making an appearance. The harbor is busy with boats getting ready for the fishing season, or out on the fishing grounds already. Cannery workers are starting to trickle in for the summer season. 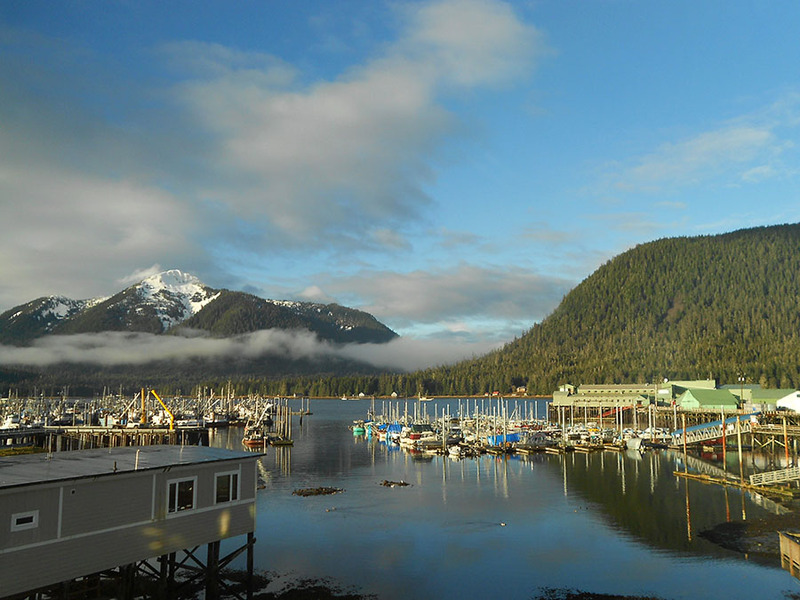 The big Steller’s sea lions are cruising around the harbor, hoping for something to be spilled as the fishing boats offload at the canneries. 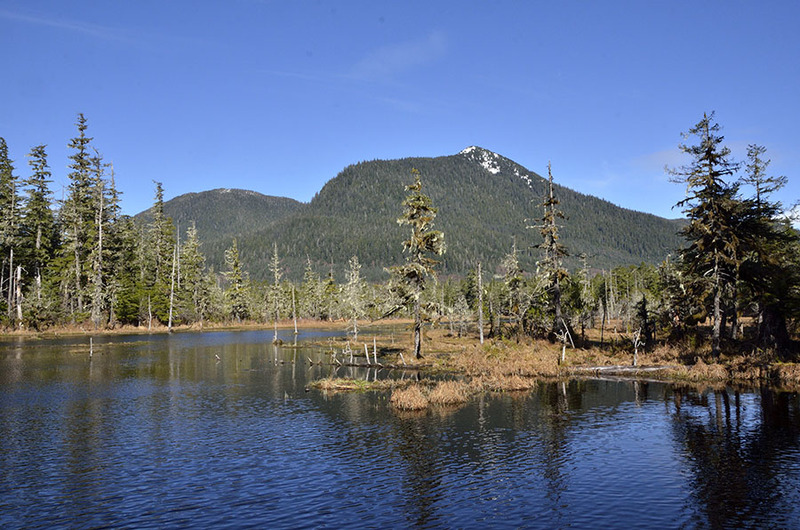 Now that the weather is warmer and we have fewer rainy days it’s a conflict between wanting to go outside to hike and explore, or to work on boat projects that couldn’t be done in the cold winter months. At the moment boat projects are winning the competition since we’re hoping to cast off the lines and start summer cruising in a couple of weeks. We arrived back in PT on Thurs., haul out Tues. to have Moby deck painted on rest of deck. We hope to get at least 1 side of the hull painted.